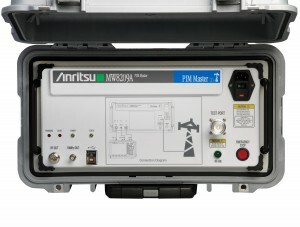 Morgan Hill, CA – November 29, 2011 – Anritsu Company introduces the MW8209A PIM Master, an innovative passive intermodulation (PIM) analyzer that covers the 900 MHz band to address the growing need to measure PIM in E-GSM networks, including UMTS Band VIII and LTE Band 8. Designed for use with Anritsu handheld analyzers, the MW8209A comes with Anritsu’s Distance-to-PIM technology, the only tool on the market that can determine if the cause of PIM is at the base station or in the surrounding environment. Field engineers and technicians can use the MW8209A to help ensure optimum performance of UMTS Band VIII and LTE Band 8 networks by locating PIM faults before intermodulation distortion adversely affects signal transmission. The MW8209A has been designed to be integrated with Anritsu’s industry leading handheld instruments, including the S332E/S362E Site Master™ cable and antenna analyzers, MS2712E/MS2713E and MS272xC Spectrum Master™ handheld spectrum analyzers, MT8212E/MT8213E Cell Master™ handheld analyzers, and the MT8221B/MT8222A BTS Master™ handheld analyzers. Field personnel can use PIM Master to generate two high-power tones in the transmit band of a base station, and use any of the compatible handheld analyzers to measure the 3rd, 5th, or 7th order intermodulation products in the receive band that travel down the same cable. Using the GPS option available on all the analyzers, the location of the measurement can be recorded, as well. A unique feature of the MW8209A is its 40 W testing, compared to alternative methods that only measure at 20 W. Using double the power allows the PIM Master to locate intermittent failures due to light corrosion, high-traffic loading, or changing weather conditions. It also permits users to find faults in a multicarrier antenna system or discover microscopic arcing in connectors. Anritsu’s proprietary Distance-to-PIM helps field engineers, technicians and contractors pinpoint passive intermodulation faults, eliminating the unknown of whether the PIM source is from the antenna system or surrounding environment. Simple, immediate, and accurate, Distance-to-PIM simultaneously informs the user of the distance and magnitude of all the PIM sources, both inside the antenna system and beyond the antenna. Distance-to-PIM testing provides the detail and insight that can expedite repairs, control repair costs, and help plan budgets. Historical data can be used to monitor a site and determine if corrections need to be made before a failure results in dropped or blocked calls. The MW8209A PIM Master is priced at $26,500. Anritsu Company (www.anritsu.com) is the American subsidiary of Anritsu Corporation, a global provider of innovative communications test and measurement solutions for more than 110 years. Anritsu provides solutions for existing and next-generation wired and wireless communication systems and operators. Anritsu products include wireless, optical, microwave/RF, and digital instruments as well as operations support systems for R&D, manufacturing, installation, and maintenance. Anritsu also provides precision microwave/RF components, optical devices, and high-speed electrical devices for communication products and systems. With offices throughout the world, Anritsu sells in over 90 countries with approximately 4,000 employees. For more information, visit www.anritsu.com.